Discussion in 'Apple and Mac OS X' started by darkloki, Sep 20, 2018. I'm beyond livid now, but I kind of knew it was going to happen and prepared for it. And by preparing I mean I picked up a Razer Blade 15 last month. But today it's official my H button stopped working on my 2016 Macbook Pro. I realize that my system is covered by warranty or apples acknowledgement that there is in fact an issue but it's annoying that my system is going to have to go to some repair depot for however long it takes and replacing the keyboard is so difficult that they're saying I need to backup my Data because they're literally going to either replace this thing or take this system through hell and back to get to the keyboard. It was only a matter of time... I take great care of my systems so I know it wasn't anything that I did or spilled on it but magically it just stopped working after 2 years. I knew those keyboards were crap from the moment my fingers landed on the keys. My 1997 IBM 760XD has a better keyboard that still works perfectly fine. How long is the estimate for the repair? I'd say after repair just sell it and move on, that keyboard isn't going to last and the warranty (applecare, if any) is going to expire next year. So after spending an hour or so at the Apple Store (waiting for a Genius, no one's fault here just really busy and I did set an appointment) the genius saw and confirmed the keyboard is faulty and is going to have to be sent to the Depot. I knew this before hand and was able to post what I said in the original post because I spoke to Apple Online Support and knew that I had to have someone at the Apple Store confirm the keyboard issue and schedule the repair. I was told it will take up to 5 business days for a repair and that they need to replace the entire upper/top level. I should have not been surprised that the normal cost for this is $800, but I still get surprised by it lol... My cost was 0 dollars due to the lawsuit or admittance by apple that there is in fact an issue with the butterfly keys (Probably Both). I will admit that it was nice Apple is willing to ship this laptop anywhere assuming I sign for it. 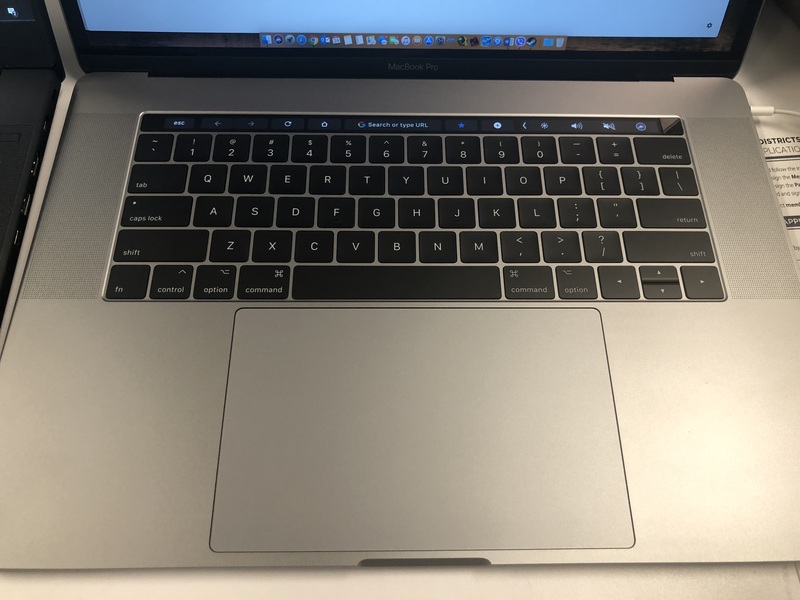 So I was able to submit the laptop from an Apple Store in Columbus Ohio (My Hometown) and have it delivered to my office in Newport Beach California where I currently live and work as this all happened while visiting home. My luck has simply been horrible though, while removing my soft shell case to submit my laptop to apple I severely gashed my pointer finger on my right hand getting blood all over the laptop, and the table at the apple store. They were nice about it and got me a first aid kit and cleaned up the mess with alcohol and gloves. In conclusion I have to admit that because I don't have to pay for anything at this point I'm not nearly as upset as I probably should be. I mean I have my Razer 15 to hold me over and it did not cost me anything. I'll let you know about the laptop when I get it back. I'm probably going to give the laptop to my dad though when I get it back. Must contain some rare material to cost that much! Or they are replacing entire mobo and every component of the laptop. Update: Just got a phone call from the Apple Store in California and my laptop is apparently ready for pickup and I just need a photo ID. While I admit it's cool that it's ready within 3 days (Submitted Thursday at 2-3 PM, Ready 4PM Saturday) The only issues are that it is not being delivered to my office I have to pick it up at the Apple Store and I'm not even in California yet, however I do fly in tomorrow so I'll just swing by after I land if I still have energy or just come over the following day. Fortunately the Apple Store is located right next to the airport, but because it was done so fast i just don't know if they actually replaced the keyboard or just gave me a whole new system. I'll let you guys know early next week. To my surprise it's my original Macbook, with the Same HDD but a new top cover which includes a new battery, I assume it's a new touchpad as well. I was surprised on how quick the turnaround was. I mean let's go over this again it was submitted on Thursday at 3pm in Columbus Ohio and by Saturday 4pm it was ready for pickup in south coast plaza (Newport Beach California) So props to apple actually on getting it done that quick, I don't think even Louis Rossmann for as good as he is can get a turnaround that quickly with even the best shipping possible. When I get back home I'll include a copy of the Workorder. I do not know if I want to sell this laptop though I'm still debating about it but one thing is for sure. 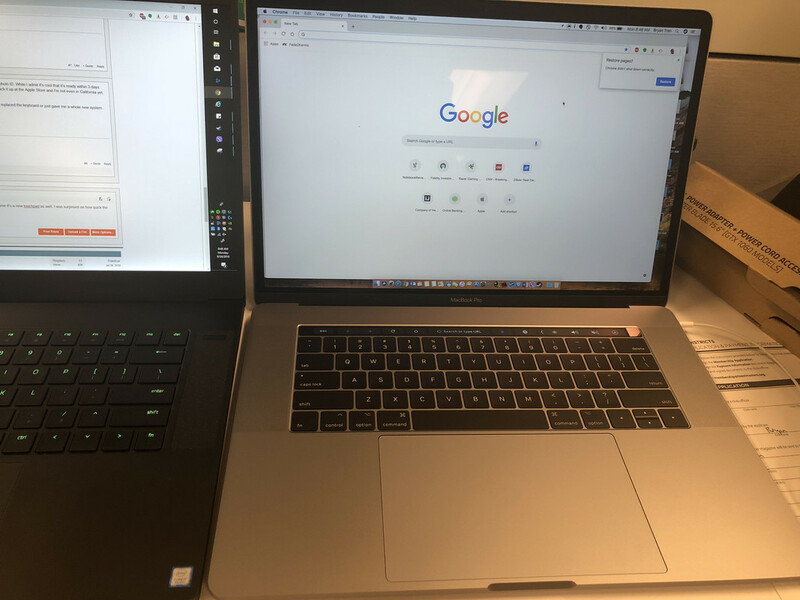 I didn't miss my Macbook for the few days it was gone and I happily traveled across the country with my Razer Blade without any issues. So it just comes down to how much do I really like OSX and the integration it has with iMessage. More then likely I'm going to pass this on to my father. Keyboard looks better now. Only if it had keyboard like Razer you'd have dumped Razer and gave the Razer to your dad. WTB 2015 Macbook Pro broken or working.